It’s the Bullets second agonising defeat of the weekend. Photo by Chris Hyde/Getty Images. BRISBANE coach Andrej Lemanis says two heart-breaking losses in the space of three days will not crush the spirit of the Bullets, who fell agonisingly short of a miraculous comeback at the Brisbane Convention Centre on Sunday night. 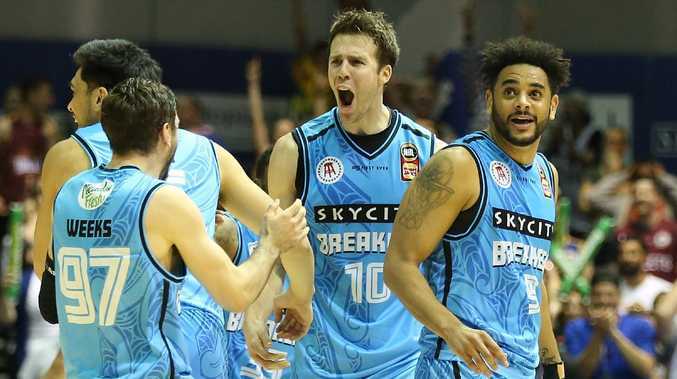 After Wildcats star Bryce Cotton hit a last-second game winner against Brisbane in Perth on Friday night, Breakers captain Tom Abercrombie on Sunday night hit a long range jumpshot with 0.3 seconds left on the clock to hand New Zealand a nail-biting 85-84 win. The Breakers led by 23 points midway through the second quarter and looked home and hosed. But the Bullets came out with all guns blazing in the third quarter and hit the lead in the dying seconds of the term to set-up a nail-biting finish. A blistering Brisbane outscored the Breakers 23-9 in the third term after being flat and fumbly in the first half when the quick and slick Breakers shot the lights out on the way to a 15-point lead at the main break. The momentum ebbed and flowed in the tense and tight fourth quarter and the scores were level at 82-all with a minute left on the clock after an Adam Gibson corner three-pointer. 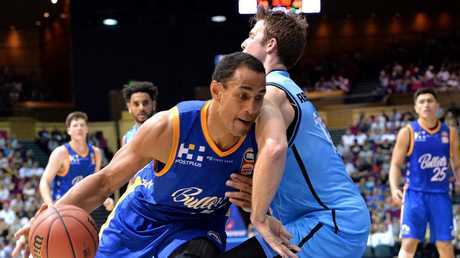 A Tai Wesley free throw put the visitors in front before Gibson earned a foul and calmly slotted his two free throws to hand Brisbane the advantage. 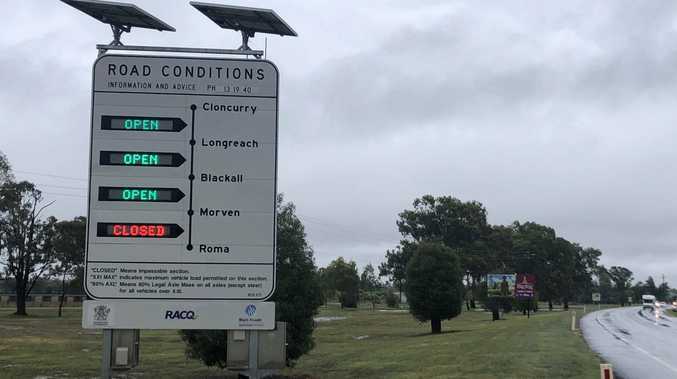 Brisbane just couldn’t close the deal. Photo by Bradley Kanaris/Getty Images. A scrambled last play saw the ball fall to Abercrombie who nailed the jumpshot. "It's tough to swallow being beaten on the buzzer like that. We defended pretty well that last possession and Tommy just made a shot,'' Lemanis said. "We are finding ourselves in holes early and then we are doing a nice job of finding a way to dig ourselves out. "We were one shot away from saying, 'oh well wasn't that a great comeback'. Breakers import Patrick Richard finished with a game-high 21 points to go with six rebounds and three assists with Abercrombie adding 15 points and five rebounds for the visitors. Gibson top-scored for Brisbane with 17 points with Reuben Te Rangi and Cam Gliddon adding 14 points apiece. Gibson said Brisbane roared back into the match by playing aggressively but the Bullets were left to lament a poor first half. The defeat is a blow to Brisbane’s playoff hopes. Photo by Chris Hyde/Getty Images. "It's not rocket science. We came out on the front foot …and that turned the game. It was getting down and dirty and playing hard,'' he said. "It shouldn't take being down 20 to get to that mindset. It's one second and we win that game like against Perth, it's 6-3 instead of 4-5. "It's a matter of two shots. Everything that leads up to that stuff is what's important. 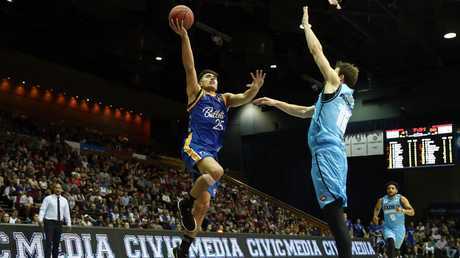 Brisbane started Round 5 in third place after a brace of wins over Adelaide last weekend but the losses to perennial powerhouses Perth and New Zealand have dropped them into fifth spot ahead of their next assignment against reigning champion Melbourne United in Melbourne this Sunday. Breakers coach Kevin Braswell said Abercrombie delivered after an indifferent start to the season. "It's good for him. Tommy's been up and down a little bit this season,'' he said. "But Tommy's going to make plays when you need him to. "Whether it's the defensive end or the offensive end - he came up with a huge offensive board as well - I thought he was great tonight on both ends.